STILL haven't been cooking much! This week it's new flooring upstairs (kitchen, living, dining) and everything has been out on both decks! It's finally coming together! Anyway, this is what we had for lunch today-- very simple and very yummy. 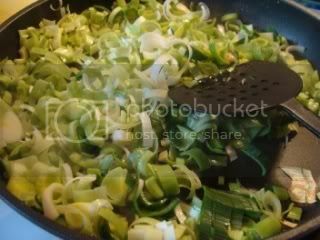 It's also something different to do with leeks, besides soup! 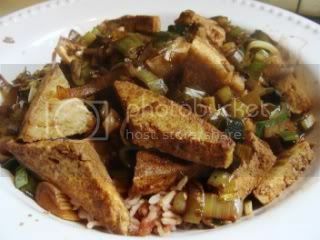 This is a very simple homestyle dish from Northern China, where leeks are used frequently. This is a great winter meal. This was adapted from a recipe in Ken Hom's Vegetarian Cookery (BBC Books, London, 1995), and appears in my book, Authentic Chinese Cuisine for the Contemporary Kitchen. Heat a large heavy nonstick skillet with the first 2 teaspoons oil over high heat. When it's hot, add the tofu slices. Cook them over high heat, watching carefully, until they get crispy and golden on the bottom, and then turn them over and brown the other side. 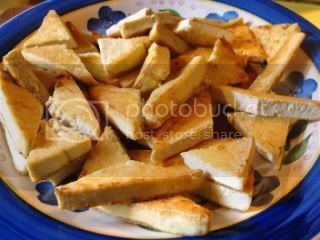 Remove from the pan and slice the pieces into small triangles. Set aside. Add the last 2 teaspoons of oil. When the oil is hot, add the leeks and garlic. Stir-fry for about 3 minutes. 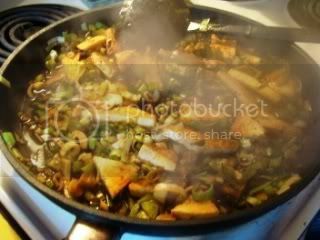 Add the tofu and the Cooking Sauce. Cook 3 minutes more and serve immediately with steamed long grain brown rice. Nutrition (per serving): 151.6 calories; 37% calories from fat; 6.4g total fat; 0.0mg cholesterol; 297.6mg sodium; 337.3mg potassium; 15.5g carbohydrates; 1.8g fiber; 4.3g sugar; 13.8g net carbs; 8.1g protein; 3.2 points. I imagine it would be great with tempeh as well! that tofu looks freakin awesome. Yummy. That looks tremendously simple and delicious. Wow--congrats on the weight loss! Wow, thanks for this. It's been a while since I had leeks. Thanks. I am from the north of China, and I love leeks and spring onions. Thanks for the recipe. I only had white wine on hand... but it was still was great! I had two teenage vegetarians over visiting and they liked it as well. A NIFTY NEW GADGET FOR PRESSING TOFU!